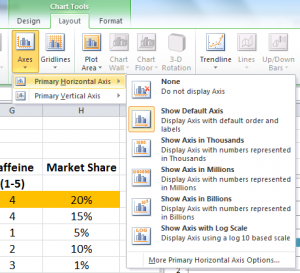 Excel has the capability to produce perceptual maps ideal for marketing strategy and market analysis purposes. However, the process is a little bit cumbersome and takes time to set up and format correctly. 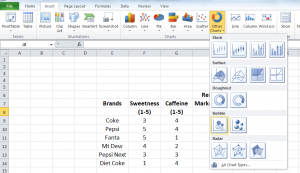 As a big time saver, you can simply download the ready-to-go Excel spreadsheet available as a free download on this site. However, if you are keen to do-it-yourself, then follow these instructions either in this video and/or all the instructions are shown in a step-by-step guide below. 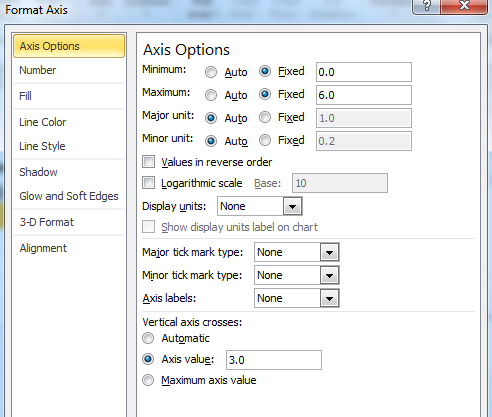 You need to have your list of brands/products and the two attributes that you have decided to use for the axis labels. 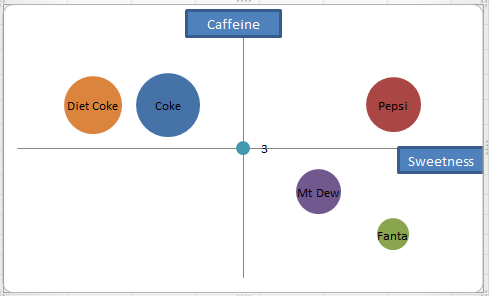 In this example, we are preparing a sample perceptual map for the soft drink market. If you are stuck for ideas to use, this website has a list of possible product attribute ideas. 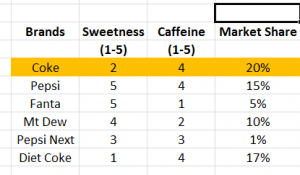 Please note that the third data column – market share – is optional. In the final perceptual map, the market share figure will make the circles on the map appear in different sizes relative to their market share. 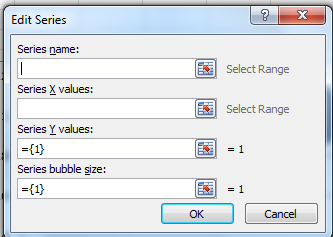 If you do not have this data, then all the bubbles on the perceptual map will be the same size. 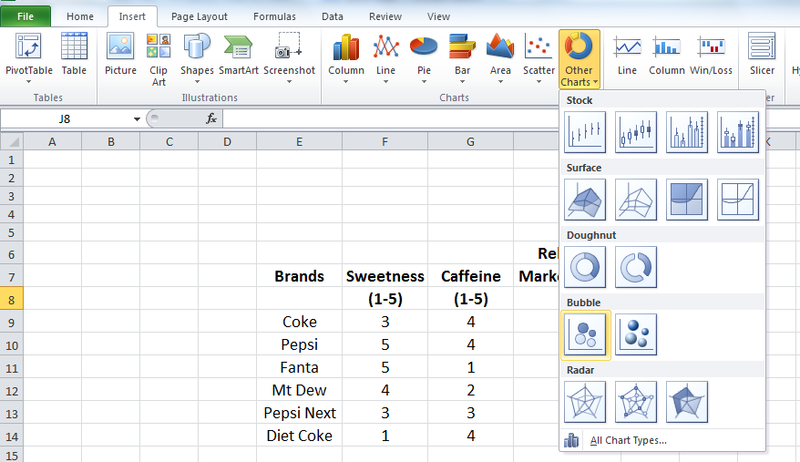 On the Excel menu across the top of the spreadsheet, click INSERT, then OTHER CHARTS, and then select a BUBBLE chart. This is shown below – you can click the image to enlarge it. You can also use a SCATTER chart format – but I have found the BUBBLE charts present better in business reports, as you have more formatting and color options. 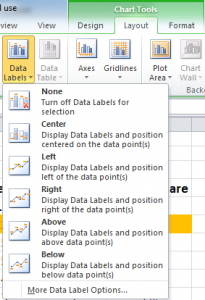 Because you have just inserted a chart, you should have a different menu across the top of Excel. 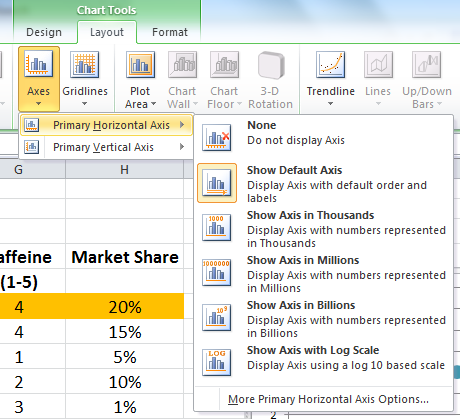 If the CHART TOOLS menu is not showing, then click on your chart (which should be completely blank at this stage) and then click DESIGN, as shown in the image below. 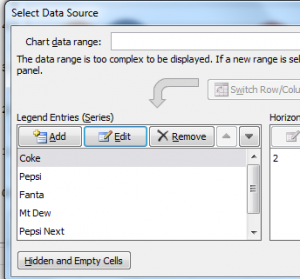 You then need to click on SELECT DATA and a pop-up window should appear, as shown in the next image. Then click ADD, which is on the left hand side in the middle and an EDIT SERIES window should pop-up. 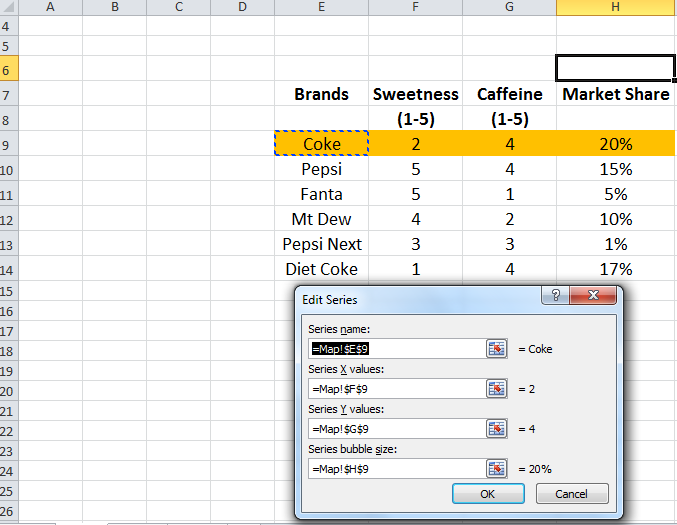 This is where we will tell Excel what data to use for the perceptual map. At this stage, you should see the following data/series entry window. Unfortunately, this is a line by line process and may take some time. Remember this is already set up in the Excel template on this site. In the following image – click to enlarge – the first brand (Coke) has been set up. I use the mouse to first click on the red arrow next to the blank field and I then click on the appropriate spreadsheet cell. 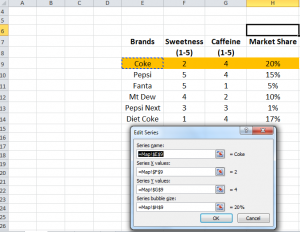 My worksheet has been named “map”, which is why =Map!$E$9 is shown in the ‘series name’ space – which simply means this worksheet and cell E9 (the word ‘Coke’). You the need to keep adding new legend entries (series) for all the brands and the attribute data. 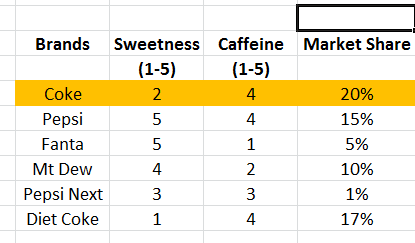 For this example, please see the following spreadsheet image showing all the series entered. Once you hit OK, your initial perceptual map should appear, as per the following example. For most perceptual maps we don’t want all the lines and numbers listed on the map. Instead we simply want to make a big plus sign in the middle of the perceptual map. 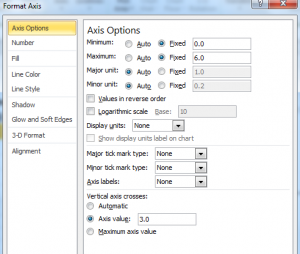 To format the chart in this manner, we need to click on LAYOUT, then AXES, and then ‘primary horizontal axis’, and finally ‘more primary horizontal axis options’ right at the bottom – as shown in the following image. This menu should open (as shown below). Please note the changes that have been made. 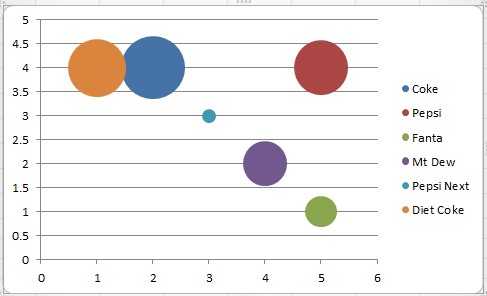 And, at the bottom, the vertical axis crosses at 3. Please note, for this example I am using a 1 to 5 scale for the attribute values, hence I have the chart axes running from 0 to 6 (to provide sufficient space). If you use a wider scale, say 1 to 9, you will need to adjust the maximum to 10, and so on. And the vertical axis cross should be the median/mid-point of the scale (if 1 to 9 scale is used, then the median/mid-point is 5). You then need to repeat the above step for the VERTICAL axis. Once you have set BOTH the horizontal and vertical axis options, as per the above instructions, then your perceptual map (at this stage) should look like the following image. 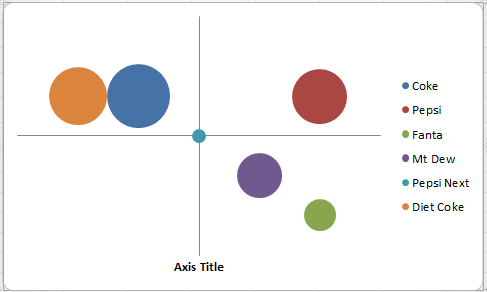 We are almost there, but we need to add the axis labels and you have the option of changing colors and putting the labels in the middle of the circles. Let’s first remove the ‘axis title’ box at the bottom by simply clicking on it and deleting it. You then need to click on INSERT and then click on SHAPES and select a rectangle (not a text box). This is shown in the next image. 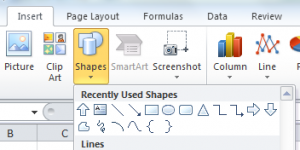 Once you select the rectangle (the 5th shape in the above menu image), then click on the function box at the top and type ‘=’ and then click on the name of the attribute on the Excel spreadsheet. This is shown in the next image. 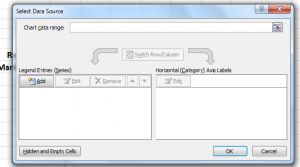 You will note that in the function (fx) box that the ‘sweetness’ cell is highlighted. You should then repeat this step for the 2nd attribute. Then your perceptual map should look like the next image (you may need to move the boxes into their preferred positions). IF you want to move the brand names to the center of the circles, instead of being listed at the side,then first delete the side labels by clicking on the brand list and then hit delete. You then you need to bring up the charts menu (click on the chart) and then click on LAYOUT and then DATA LABELS and then click on MORE DATA LABEL OPTIONS (listed right at the bottom of the menu – see image below). Once you have done this, the following new window should pop-up. 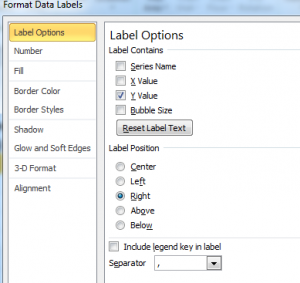 We need to do two things on this ‘format data labels’ menu. 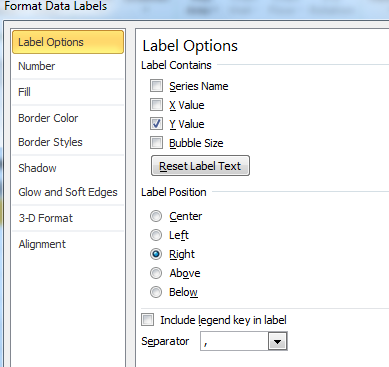 First we need to reset ‘label contains’ from the default setting of the Y Value to Series Name. 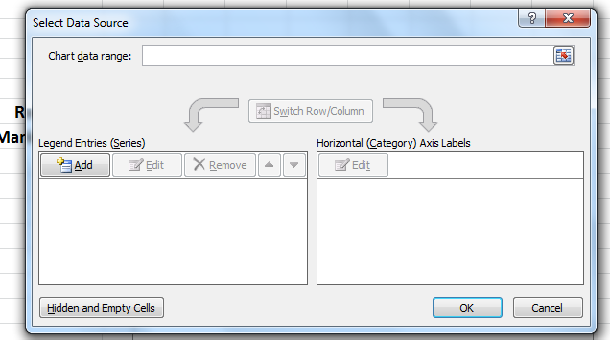 And then you can decide where the ‘label position’ will be (I would suggest center). 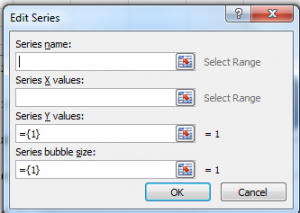 The above is the default – unclick Y value and select Series Name instead. After selecting Series Name your perceptual map should now look like the following image. 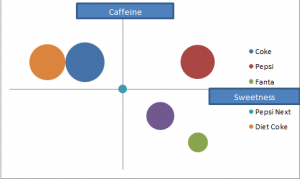 So here is your perceptual map – you can add a heading on the map (in the same way that we did the axis labels) or you can add a heading in your marketing report. However, as mentioned at the start on these instructions, I have already set up an Excel template that is easy-to-use and ready-to-go.